Original Editors - Kori Ivanchak & Madelaine Nolan from Bellarmine University's Pathophysiology of Complex Patient Problems project. Emery-Dreifuss Muscular Dystrophy (EDMD) is a rare genetic degenerative disease affecting skeletal muscle and the heart. EDMD is one of the nine types of muscular dystrophy. There are approximately 250,000 individuals in the United States affected by some type of muscular dystrophy. The incidence of X-linked Emery Dreifuss Muscular Dystrophy is estimated to affect 1 in 100,000 people in the general population, and it is believed to be the third most common type of muscular dystrophy. X-linked EDMD is fully expressed in males only; however, 10-20% of female carriers for X-linked EDMD will develop heart conduction defects and/or muscle weakness. • Progressive atrophy of humero-peroneal distribution (proximal muscles of upper limb and distal muscles of lower limb). Late into the disease, proximal limb girdle musculature becomes weak as well. Women who are carriers of X-linked EDMD will not have skeletal muscle involvement, but may have the cardiac abnormalities. Individuals with EDMD present with a wide variety of cardiac abnormalities including atrial standstill, atrial fibrillation, congestive heart failure, and cardioembolic stroke. The population is at high risk for devloping severe bradyarrhythmias which carries a risk of sudden death, and supraventricular tachyarrhythmias which are associated with a high risk for thromboembolic stroke. It is important to note that cardiac and muscular involvement have not been shown to be closesly related, with cases of severe cardiomyopathy occuring in patients with only mild muscular symptoms. It is possible for stroke to be the first clinical manifestation of EDMD. The clinical diagnosis of EDMD is made based on the presence of the triad listed in the Clinical Presentation section. Electromyogram (EMG) usually show myopathic features with normal nerve conduction studies. However, neuropathic patterns have been discovered in X-Linked EDMD and autosomal dominant EDMD. CT scan shows a diffuse pattern of involvement in muscles including the biceps, soleus, peroneal, external vasti, gluteus, and paravertebral muscles. Findings in the calf and posterior thigh have been reported in patients with Autosomal Dominant EDMD. Serum CK Concentration may be normal or moderately elevated up to 2-20x upper normal level. Increases are seen more often at the beginning of the disease as opposed to later stages. Muscle Histopathology shows nonspecific myopathic or dystrophic changes: variation in fiber size, increase in internal nuclei, increase in endomysial connective tissue, necrotic fibers. Electron Microscopy may show specific alterations in nuclear architecture. Muscle Biopsy is rarely performed for diagnostic purposes due to lack of specificity. Immunodetection of Emerin (detected by immunofluorescence and/or by western blot): Absent in 95% of individuals with X-Linked EDMD. Normally expressed in individuals with Autosomal Dominant EDMD. Immunodetection of FHL1 (detected by immunofluorescence and/or by western blot): Absent or significantly decreased in individuals with FHL1-related X-Linked EDMD. Genetic testing can determine the presence of particular defects that cause EDMD and can help predict the course of the disease, as well as help assess the risk of passing the disease on to the next generation. This type of EDMD is caused by a mutation in the EMD gene, which helps make the protein emerin. Emerin is needed for the normal function of skeletal and cardiac muscles; although, it is not known how a lack of emerin causes the signs and symptoms seen with the disease. These EDMDs are caused by a mutation in the LMNA gene, which helps to make the proteins lamin A and lamin C. The mutation creates an altered version of these proteins. There is a theory that the mutation in these genes causes a destabilized nuclear membrane, which can lead to muscle breakdown. It is still not understood why skeletal and cardiac muscle are only affected when the proteins can be found throughout the body. X-linked EDMD: The EMD gene mutation is carried on the X chromosome. Males are more likely to be affected by this disorder and inherit the mutated gene from a female carrier. A female must have two mutated X chromosomes in order to have this disorder. A female with only one mutated X chromosome is considered a carrier for the disorder. 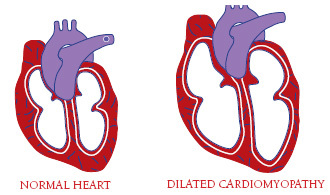 A female carrier is usually asymptomatic, but is still at risk for cardiac problems. Autosomal Dominant EDMD: This means that one copy of the altered LMNA gene is enough to cause the disorder. There does not need to be a family history of EDMD in order for this type of gene mutation to occur. Autosomal Recessive EDMD: This occurs when an individual has two copies of the altered LMNA gene, one copy from each parent. An individual with only one gene mutation is considered a carrier. Emery Dreifuss Muscular Dystrophy affects voluntary muscles, as well as the heart. Early symptoms include weakness and atrophy in a humero-peroneal distribution, that will eventually affect the scapular and pelvic girdle muscles. Contractures will occur, and can make arm, neck, ankle, and spine movements difficult, leading to to "toe-walking" and difficulty bending the elbows. Cardiac conduction defecits and arrythmias may occur, resulting in dilated cardiac myopathy, poor exercise tolerance, bradycardia, syncope, congestive heart failure, and an increased risk of stroke and sudden death. Women who are genetic carriers for X-linked EDMD may also be at risk for cardiac problems, with the risk increasing with age. However, carriers tend not to present with muscle weakness or contractures. There is no specific treatment for EDMD. Treatment is determined based on individual symptoms. Genetic counseling may be needed for the individual and his/her family. Currently, there is no effective treatment for muscular dystrophy. However, gene-based therapy is being researched for the treatment of Duchenne Muscular Dystrophy. This may eventually lead to a treatment option for EDMD. Physical Therapy for patients with Emery Dreifuss Muscular Dystrophy is centered on treating the impairments that result from the disease. Patients should see physical therapists soon after being diagnosed. Because of the older age of diagnosis compared to other muscular dystrophies, this population will most likely not need to have their motor development assessed. However, physical therapy interventions will be imperative to patients' quaility of life. Emery Dreifuss Muscular Dystrophy must be differentiated from other diagnoses, primarily, the other types of muscular dystrophies. Duchenne Muscular Dystrophy- First recognized at age 3 to 6. Characterized by muscle weakness and atrophy starting in the pelvic area, progressing to shoulders, and eventually most major muscles of the body. Becker Muscular Dystrophy- Begins during second or third decade of life. Affects males almost exclusively. Hip and shoulder muscles are weakened, gait abnormalities develop, as well as possible mild mental retardation. Fascioscapulohumeral Muscular Dystrophy (Landouzy-Dejerine Muscular Dystrophy)- Onset is usually during adolescence or early adulthood. Characterized by weakness of facial, shoulder, and upper arm muscles. Impaired ability to close eyes, move the lips, and raise arms overhead may occur. Eventually weakness and atrophy may affect the lower extremity as well. Limb Girdle Muscular Dystrophy- a group of rare progressive genetic disorders characterized by atrophy and weakness of the hip and shoulder girdles. Rigid Spine Syndrome- rare neuromuscular disorder characterized by hypotonia, weakness, contractures, and atrophy of muscles. Scoliosis often occurs. May occur in conjunction with EDMD. Myopathies- Diseases to consider may include Pompe disease, dermatomyositis, polymyositis, and nemaline myopathy. Myasthenia Gravis- autoimmune disorder of the peripheral nerves characterized by weakness with repetitive use of a muscle, followed by recovery during a period of rest. Most commonly affects the bulbar muscles with fluctuating generalized weakness. Spinal Muscular Atrophy- Presents with weakness and atrophy in the limbs, respiratory, and bulbar muscles. In order to differentiate EDMD from a neurological problem, a neurological screening can be performed. Saraiva F, Rodrigues D, Andrade H, Negrão L, Gonçalves L, Marinho A, et al. Emery-Dreifuss muscular dystrophy: Case report. Revista Portuguesa de Cardiologia (English Edition). 2012;31(3):241-5. Dell’Amore A, Botta L, Martin Suarez S, Lo Forte A, Mikus E, Camurri N, et al., editors. Heart transplantation in patients with Emery-Dreifuss muscular dystrophy: case reports. Transplantation proceedings; 2007: Elsevier. Ca J, Somasekar D, Gurucharan A, Perugu P, Sv A, Kv S. An uncommon variant of rare type of muscular dystrophy. International Journal of Research in Medical Sciences. 2013;1(3):313. Titin in muscular dystrophy and cardiomyopathy: Urinary titin as a novel marker. ↑ 2.00 2.01 2.02 2.03 2.04 2.05 2.06 2.07 2.08 2.09 2.10 2.11 2.12 Lammerding, J. Emery Dreifuss Muscular Dystrophy. Available at: http://www.rarediseases.org/rare-disease-information/rare-diseases/byID/590/viewFullReport. Accessed March 3, 2014. (accessed 3 March 2014). ↑ 3.0 3.1 Helbling-Leclerc A, Bonne G, Schwartz K. Emery Dreifuss Muscular Dystrophy. http://www.nature.com/ejhg/journal/v10/n3/full/5200744a.html (accessed 3 March 2014). ↑ 4.0 4.1 4.2 Emery Dreifuss Muscular Dystrophy. http://ghr.nlm.nih.gov/condition/emery-dreifuss-muscular-dystrophy (accessed 3 March 2014). ↑ Emery AE. Emery–Dreifuss muscular dystrophy–a 40 year retrospective. Neuromuscular Disorders. 2000;10(4):228-32. ↑ Boriani G, Gallina M, Merlini L, et al. Clinical Relevance of Atrial Fibrillation/Flutter, Stroke, Pacemaker Implant, and Heart Failure in Emery-Dreifuss Muscular Dystrophy: A Long-Term Longitudinal Study . Stroke . 2003;34 (4 ):901–908. Available at: http://stroke.ahajournals.org/content/34/4/901.abstract. ↑ 9.0 9.1 9.2 9.3 9.4 Emery-Dreifuss muscular dystrophy. http://ghr.nlm.nih.gov/condition/emery-dreifuss-muscular-dystrophy (accessed 16 March 2014). ↑ Goyenvalle A, Seto JT, Davies KE, Chamberlain J. Therapeutic approaches to muscular dystrophy. Human molecular genetics. 2011;20(R1):R69-R78. ↑ 11.0 11.1 Physical Therapist's Guide to Muscular Dystrophies in Children. http://www.moveforwardpt.com/symptomsconditionsdetail.aspx?cid=11b647e2-58e0-4b84-9d27-61d24ff3af10#top (accessed 7 April 2014). ↑ 12.0 12.1 Lopate, G. Emery-Dreifuss Muscular Dystrophy differential diagnosis. http://emedicine.medscape.com/article/1178994-differential (accessed 6 March 20). ↑ 13.0 13.1 Greenberg DA, Aminoff MJ, Simon RP. Clinical Neurology, 8th ed. United States of America: The McGraw-Hill Companies, Inc; 2012.